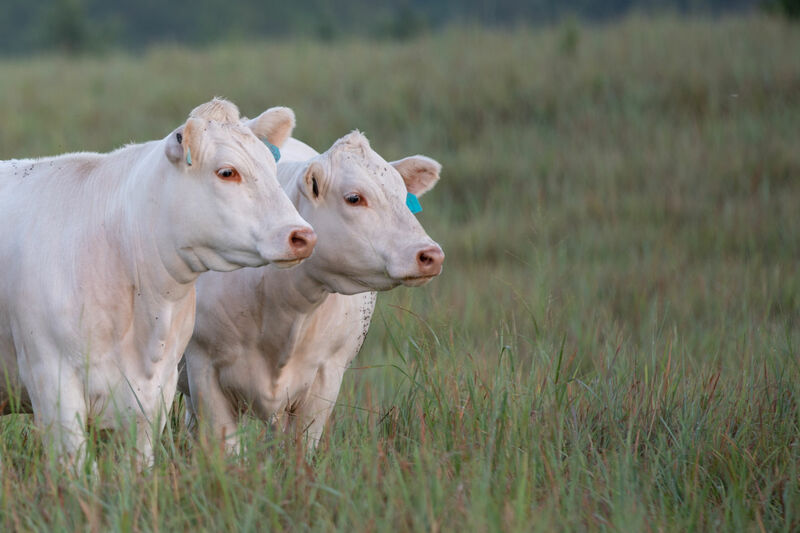 Cody Cattle Company (CCC) is a purebred Charolais ranch owned and operated by Cody and Lindsay Runft. CCC markets yearling and 18-month-old bulls in the spring and fall, as well as a select number of females each fall. Cody was raised on the Runft Charolais Ranch (RCR) in north-central Kansas. There, he established his love of the Charolais breed as a third-generation Charolais cattleman. With RCR genetics as the foundation, and a dream of one day selling white bulls to commercial cattlemen, CCC was founded. Lindsay grew up in south-central Kansas, a fifth generation in her family’s farming and stocker cattle operation. Her earliest, and most fond, childhood memories from the family ranch in Pretty Prairie are learning to ride a horse out on the “big hill” and pushing cattle down dusty dirt roads. Cody’s collegiate livestock judging career took him to Hutchinson Community College and then Texas A&M University, where he graduated with a degree in animal science. 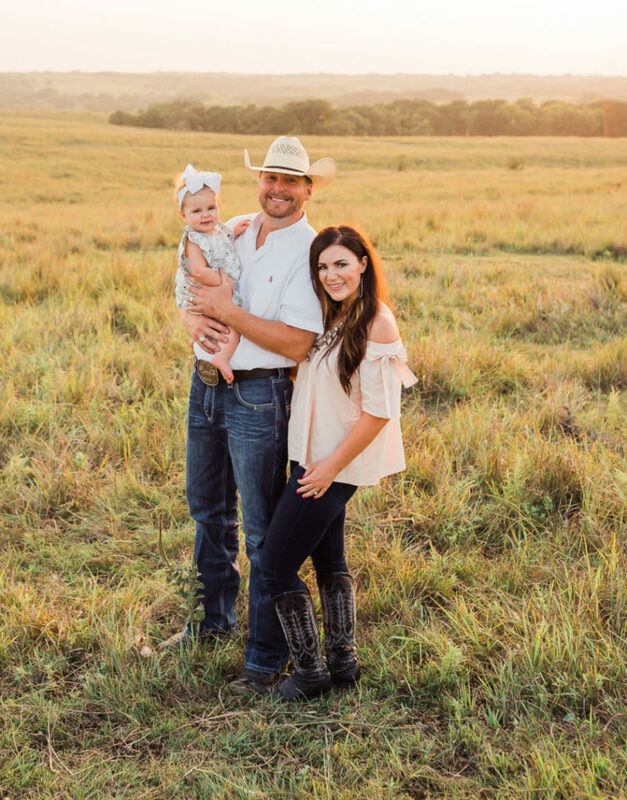 Lindsay graduated from Kansas State University with a dual-degree in animal science and agricultural communications, and then attained a Master of Science degree in ag communications from Texas Tech University. We are located in north-central Kansas, about an hour north of Salina on 36 Highway. We’d love to have you out for a herd tour. Don’t hesitate to call or write! 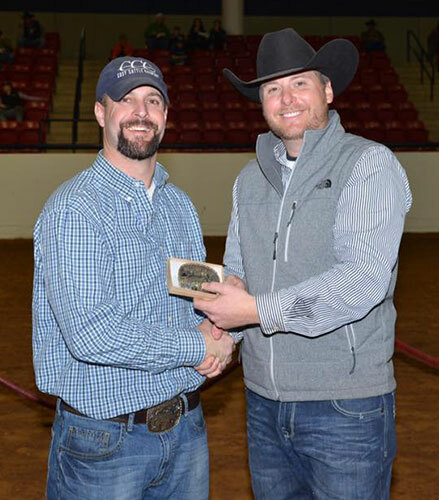 An eye for good cattle and an inherited interest in the Charolais breed have gone full circle for Cody Runft, this year’s recipient of the Ted Kelly Memorial Herdsman of the Year award. Now, 20 years after purchasing his first Charolais show heifer from the family herd, Runft has plenty of achievements to reflect upon, but none top the honor bestowed on him just prior to selection of the Grand Champion Bull at the 48th National Charolais Show held January 28 in Fort Worth, Texas. Tradition has past Herdsman of the Year honorees join together in giving the newly tapped Herdsman a haircut following conclusion of the National Show. “I got my start, probably a little later than some, and showed my first animal when I was 13,” said Runft who grew up in Scandia, Kan. “I started buying a heifer a year from Runft Charolais. Show heifers turned into a cow herd, and the cow herd turned into my passion. A true ambassador for the breed, Runft is quick to give a litany of reasons why he enjoys breeding Charolais cattle. But, G532 was still a good pick. She raised the Reserve National Champion Bull in 2011 – CCC Bud Heavy 903 PLD ET. Through the sale of many progeny, she also impacted the development of Cody Cattle Company. Then, through his friendship with Chris Peuster, managing partner at Wright Charolais in Richmond, Mo., he met Derry Wright. “Nine years ago I moved my cattle to Missouri. Derry and I started buying bulls and cows together. It’s been a good partnership from day one,” said Runft. Now, as owner of Cody Cattle Company, and a partner with Wright Charolais, Runft stays busy focusing on the two herds and their customers. But Runft is quick to attribute successes for both programs to a team effort. Recently married to Lindsay Graber on Oct. 1, 2016, he credits this new partnership and the entire crew at Wright Charolais for the “cussin’ and discussion” that leads to success. “We enjoy showing the Pens of Three and Pens of Five in Denver and put most of our effort on the Pen Show,” said Runft, noting that Cody Cattle Company had the Reserve Grand Champion Pen of Three there in January, behind Wright Charolais’ Grand Champion Pen. Wright Charolais also had the Reserve Grand Champion Pen of 5, behind Zenhnder-Wagee Partnership, whose Grand Champion Pen was all sired by a Cody Cattle Company and Wright Charolais bull, CCC WC Resource 417P, purchased in 2015. It was another good day in Denver. As published in the March 2017 edition of the Charolais Journal.